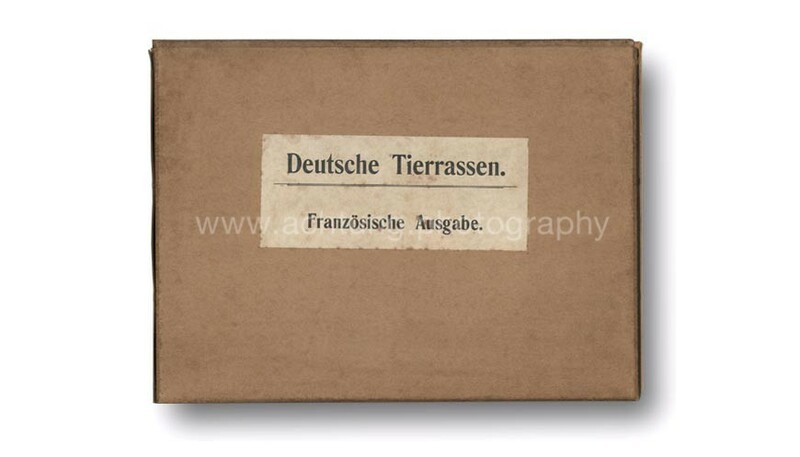 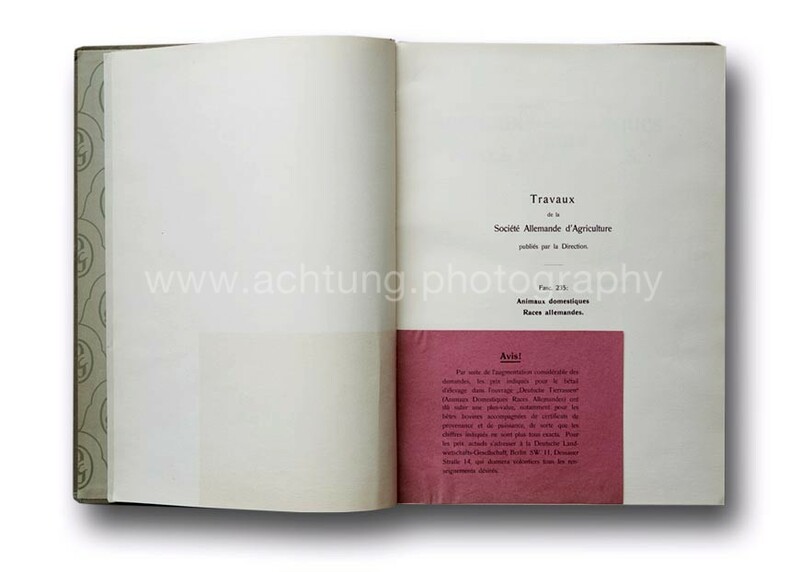 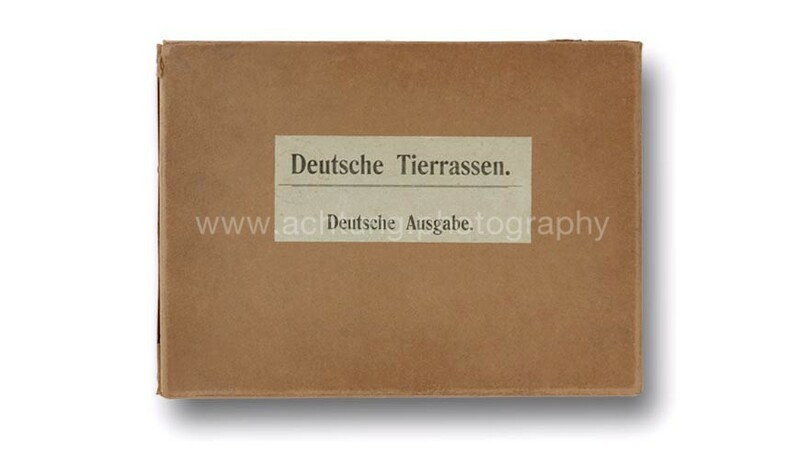 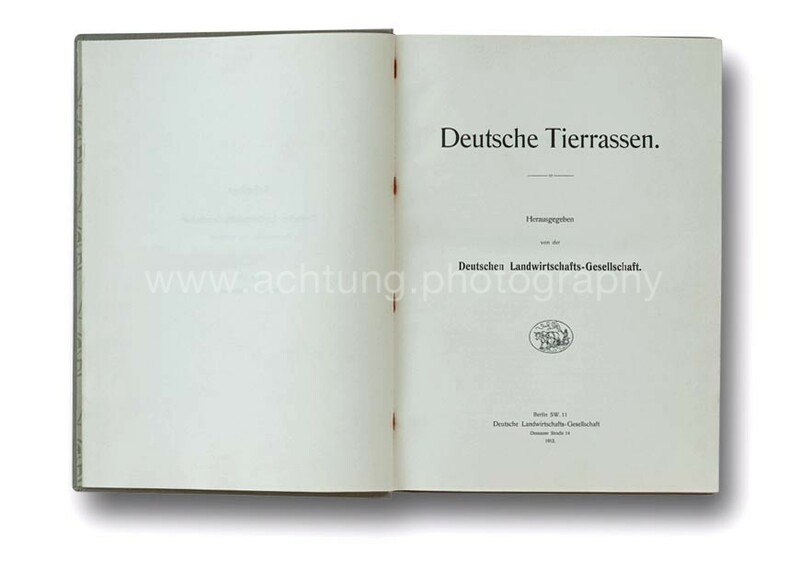 Deutsche Tierrassen is an unintentional photobook. 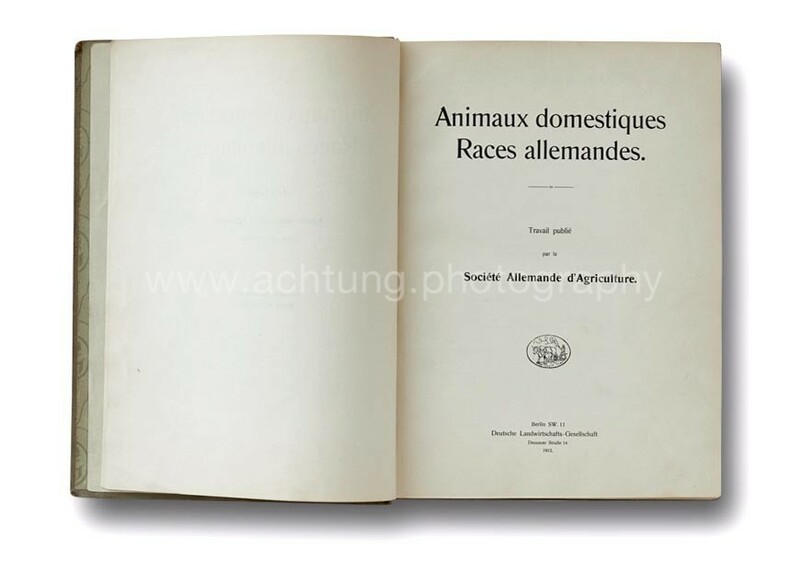 My research accidentally led me to this wonderful and extraordinary volume, published by Die Deutsche Landwirtschafts-Gesellschaft (The German Agricultural Society) 1912-1913. 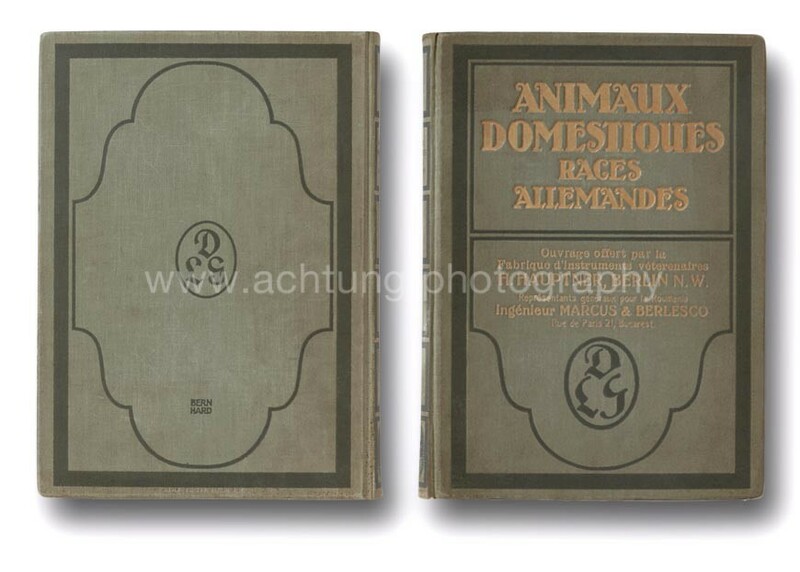 It was intended as an informative overview, for promotional purposes, of German breeds of domesticated animal. 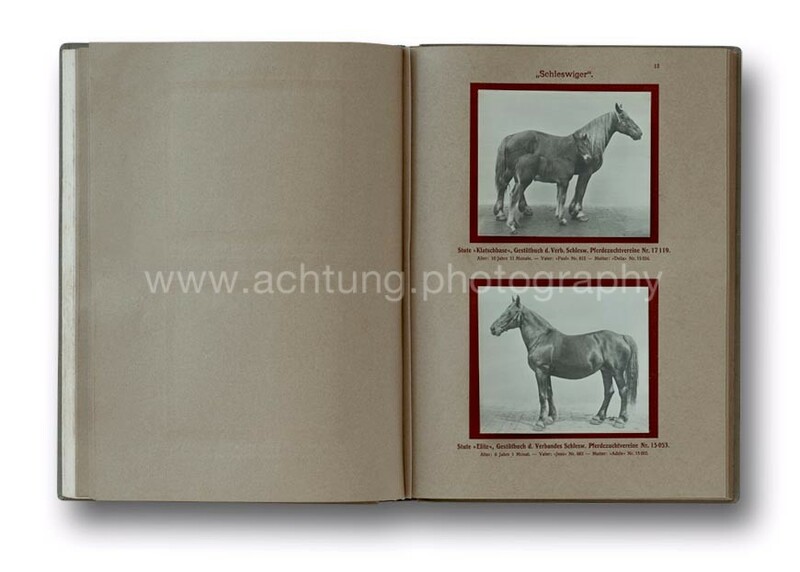 The text part of the book provides thoroughly detailed information concerning horses, cattle, sheep and pigs. 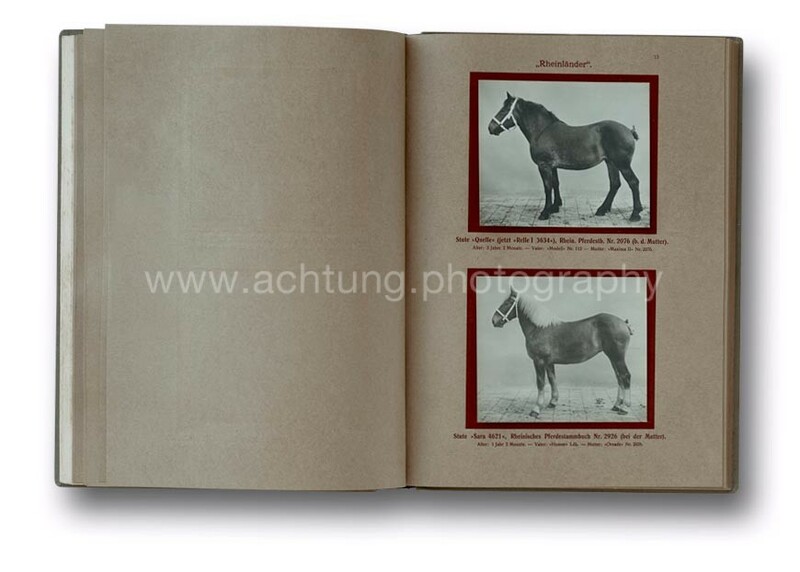 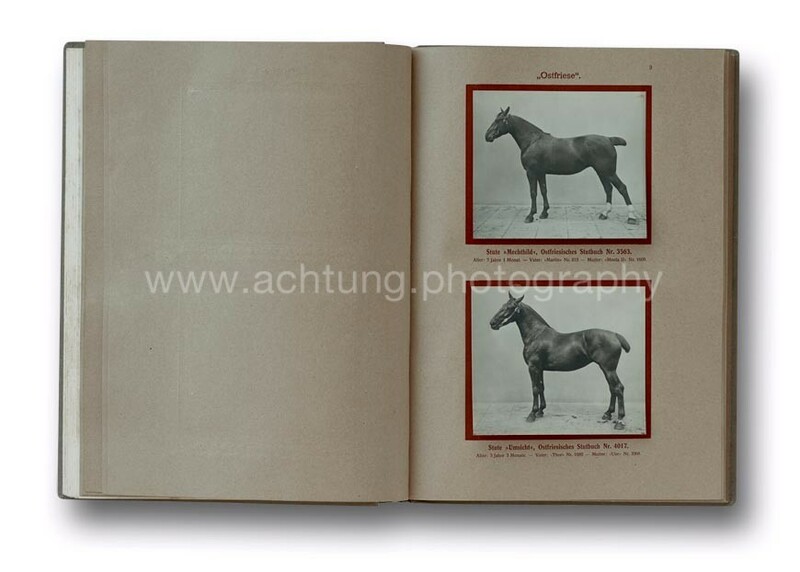 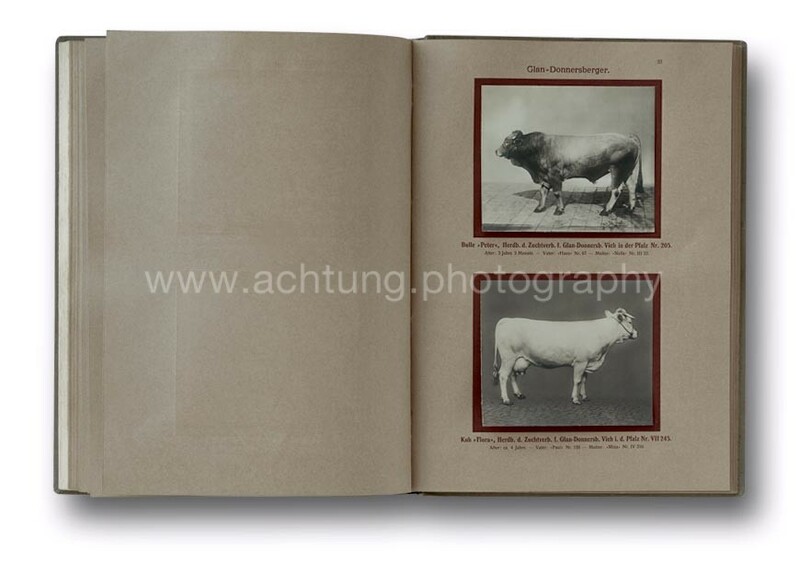 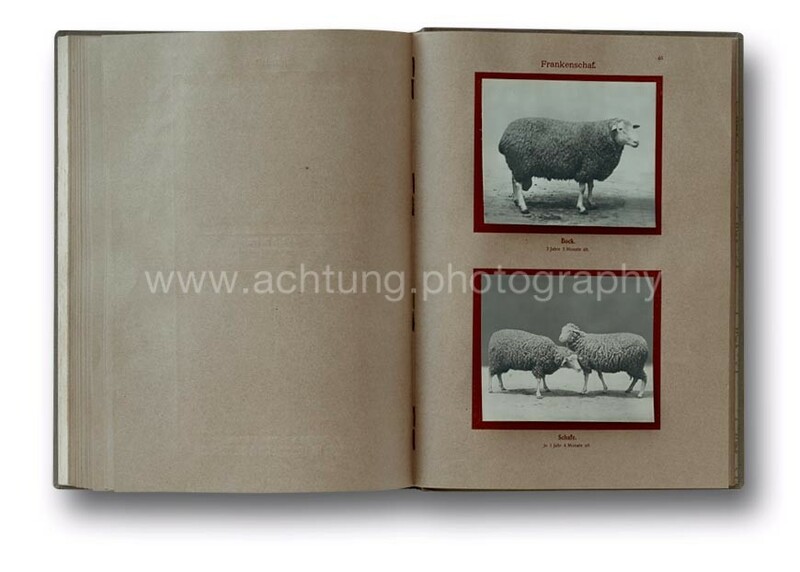 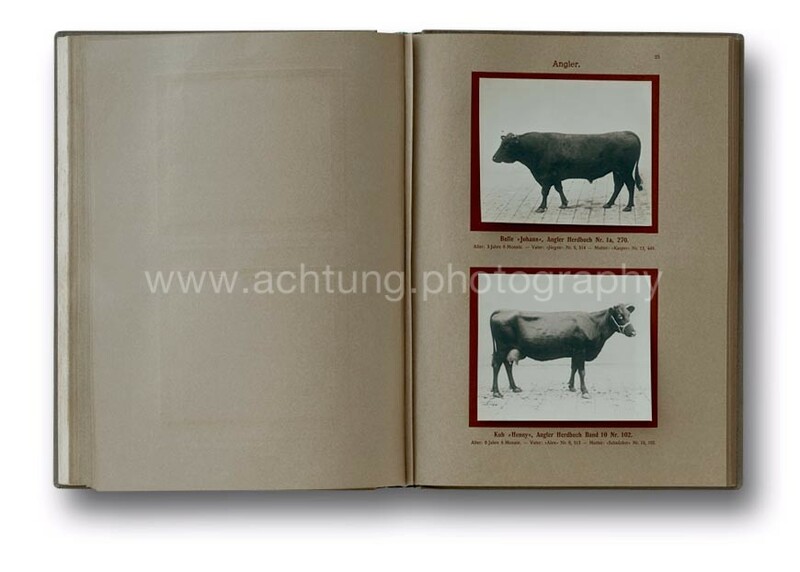 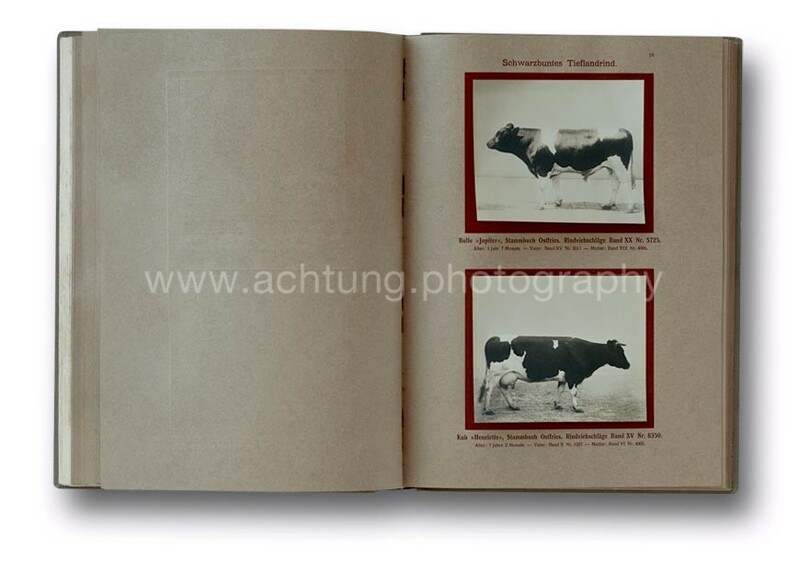 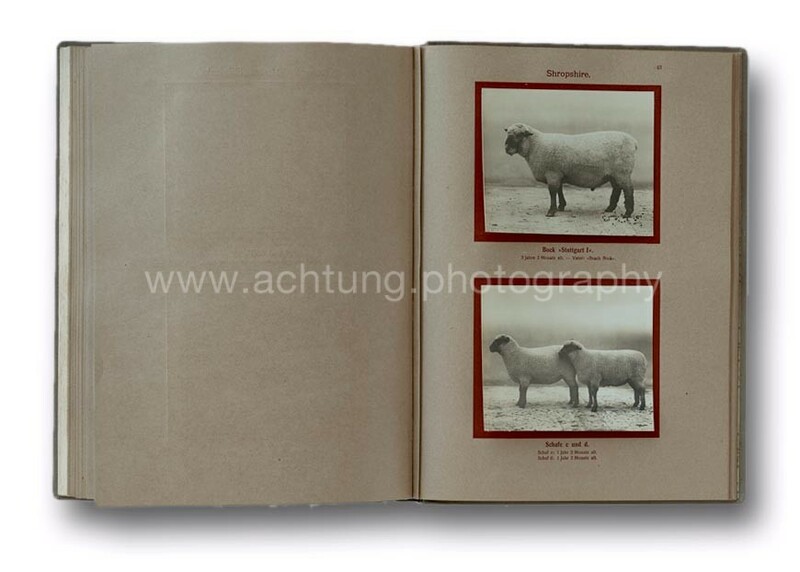 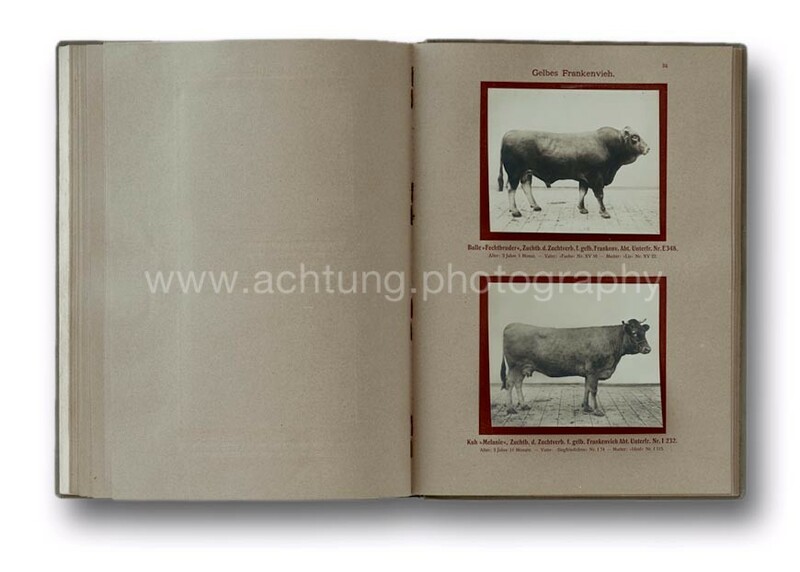 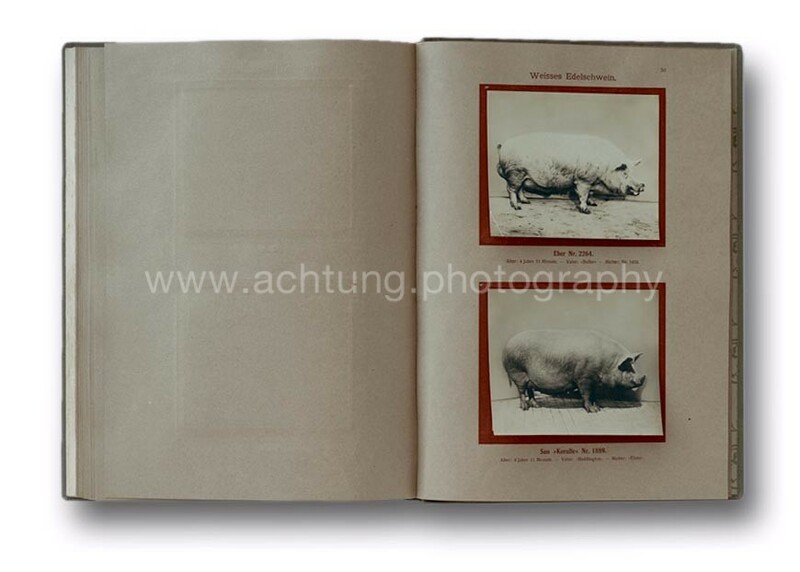 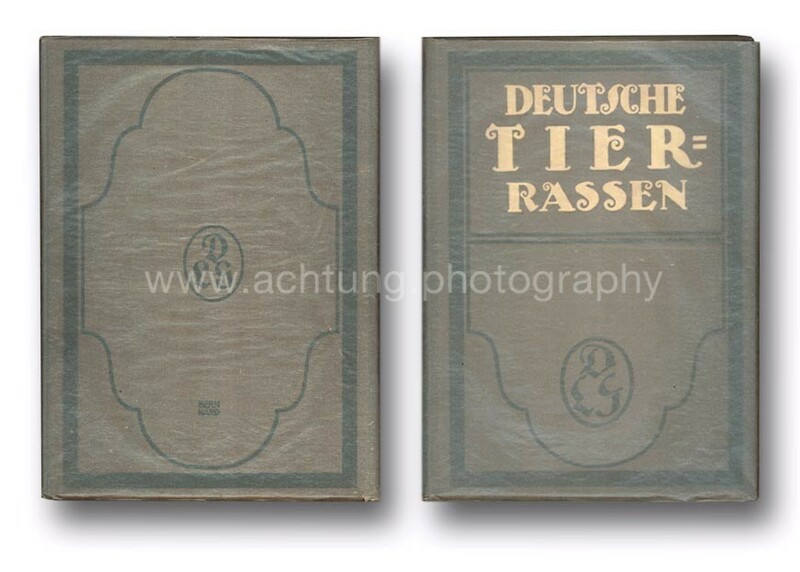 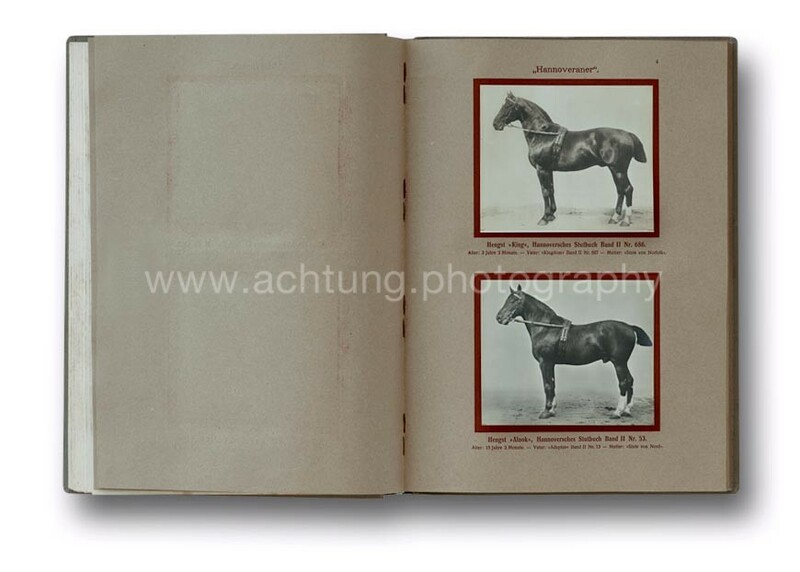 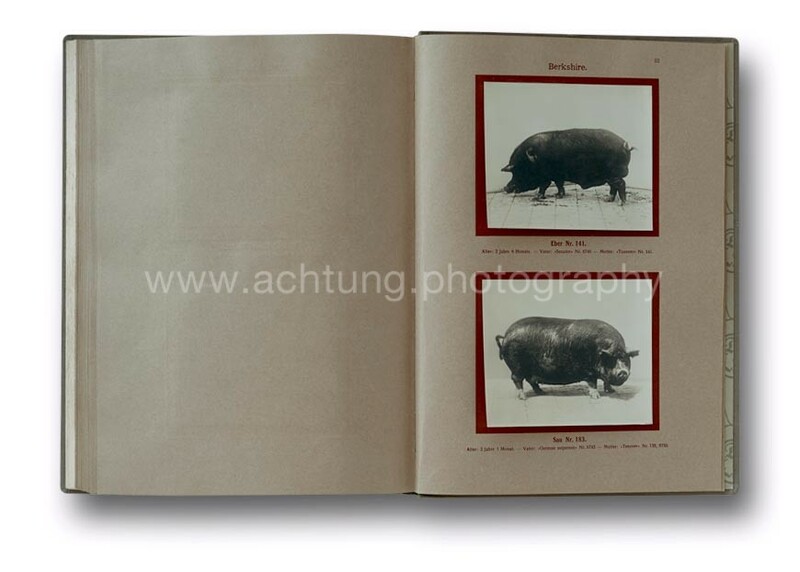 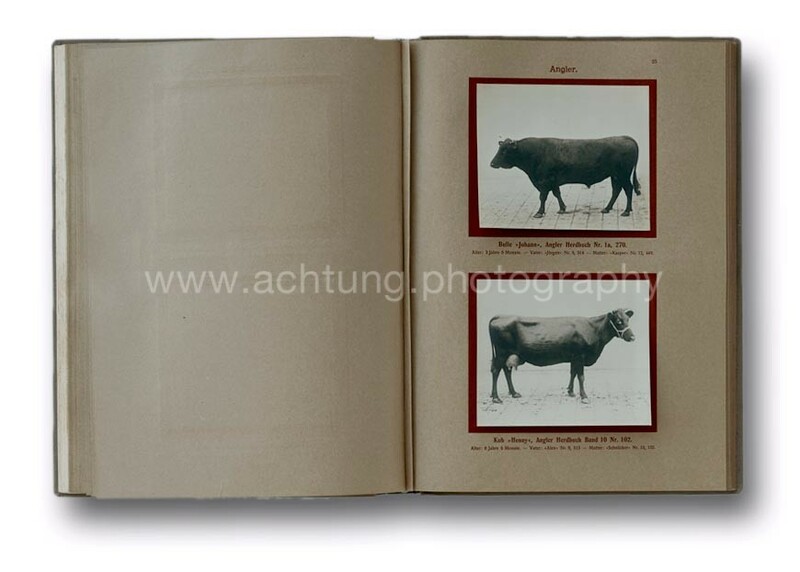 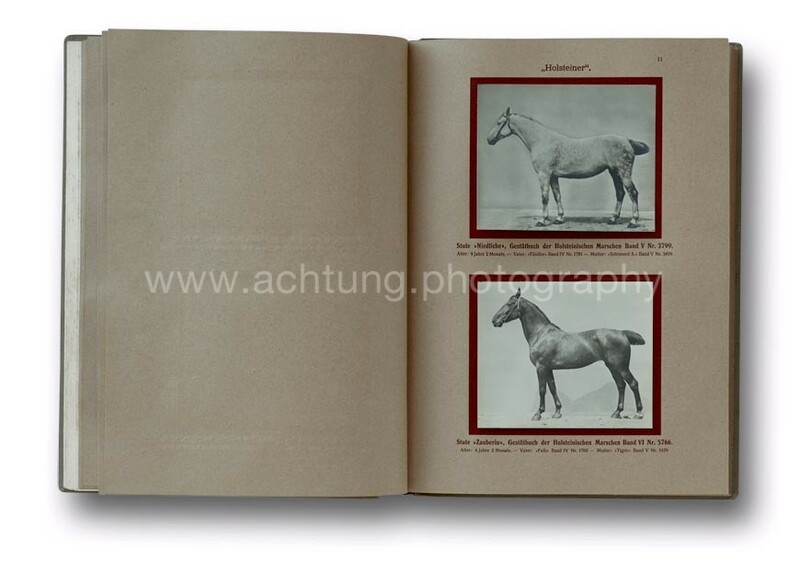 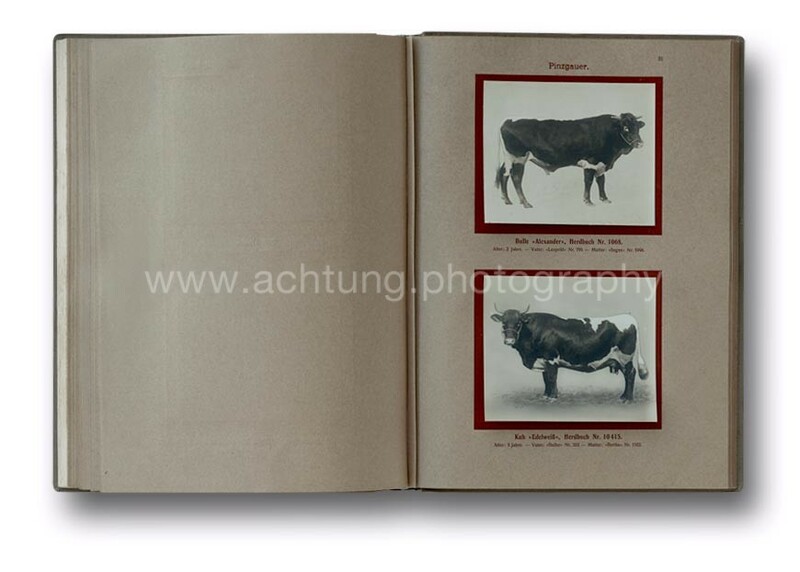 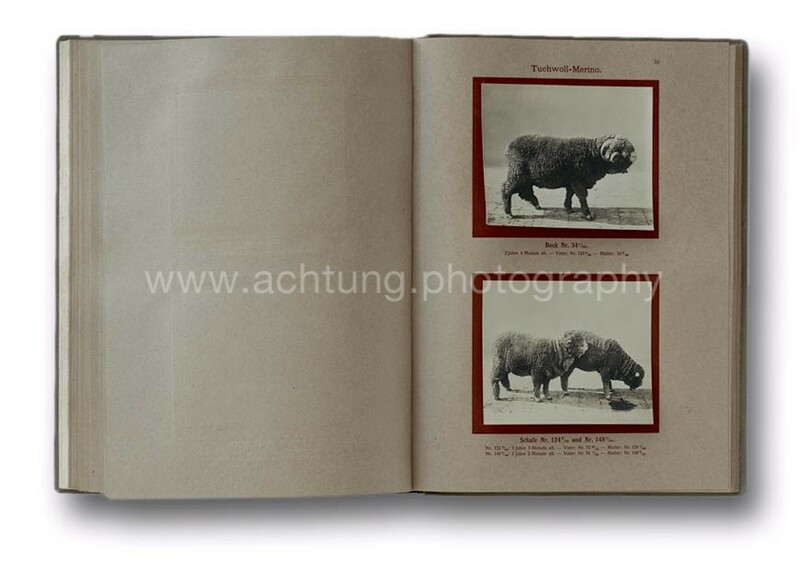 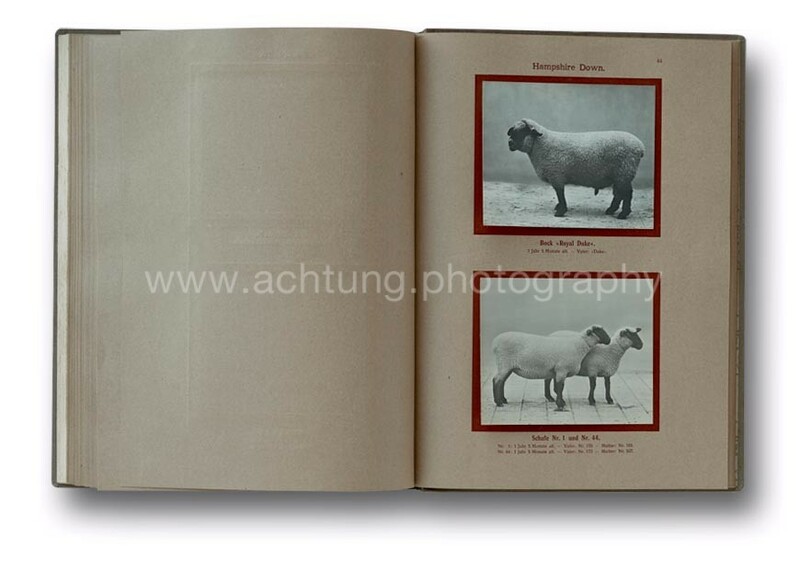 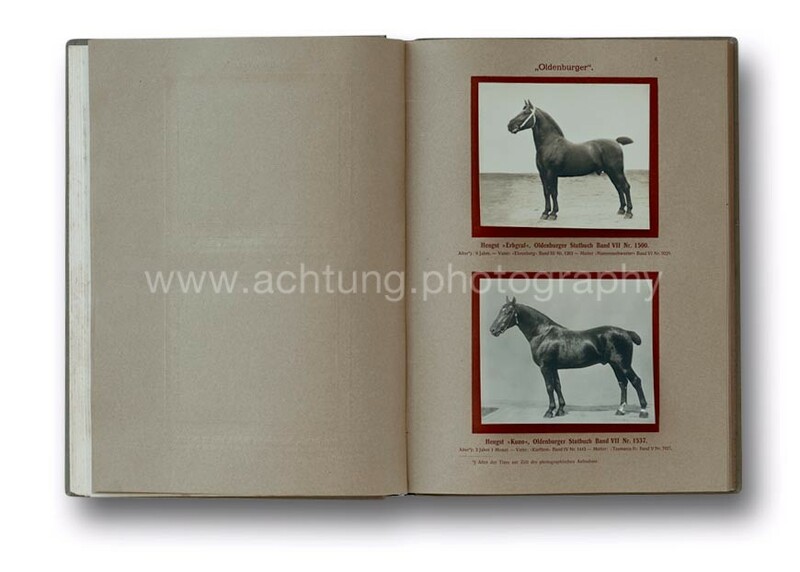 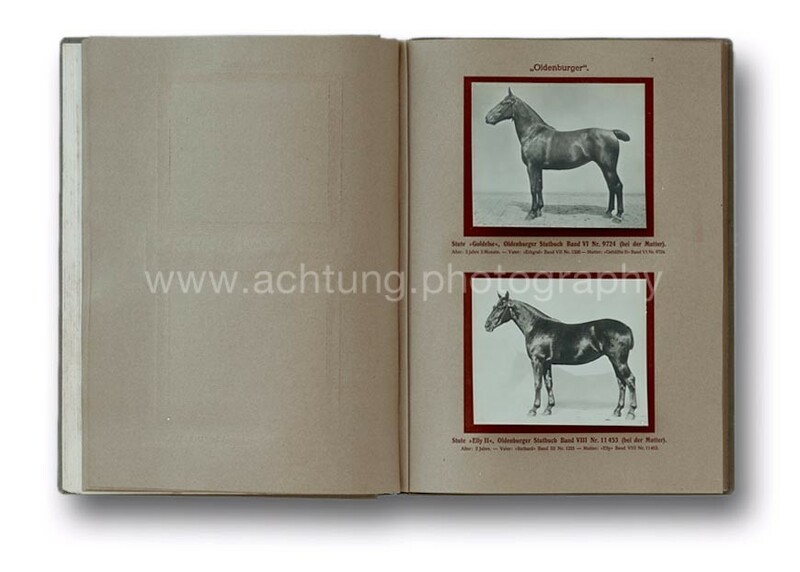 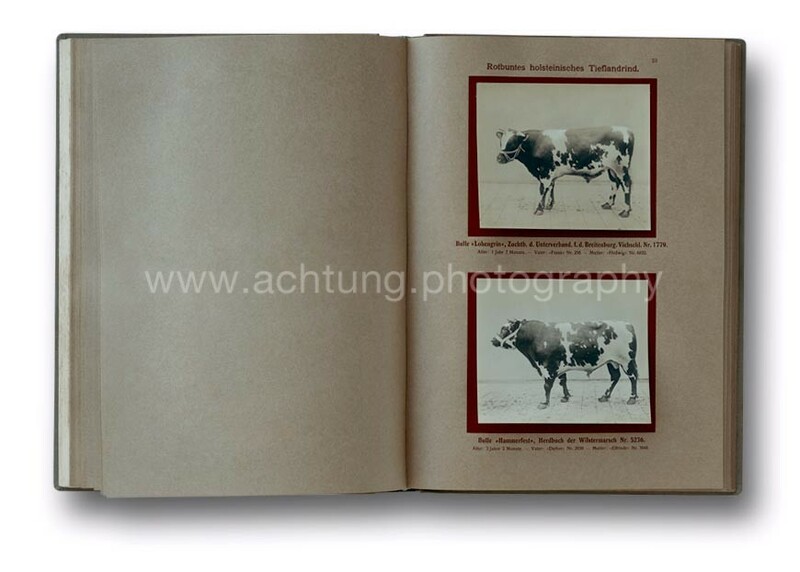 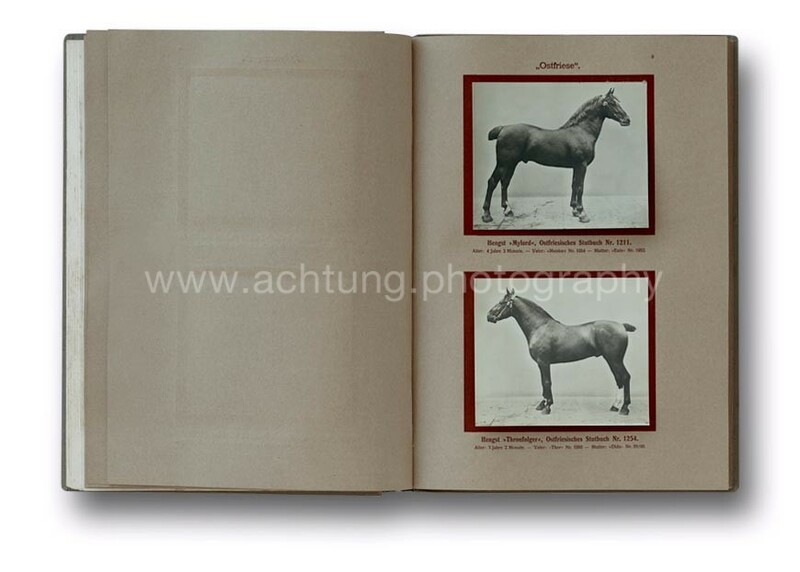 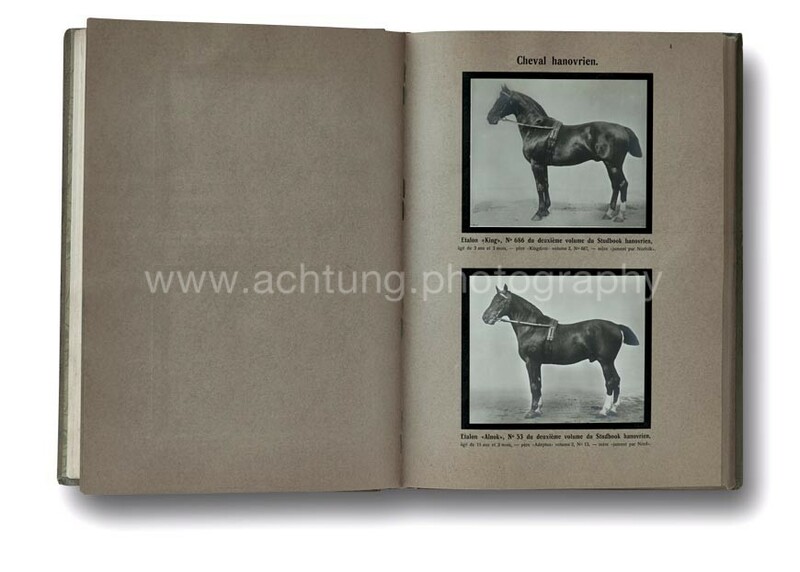 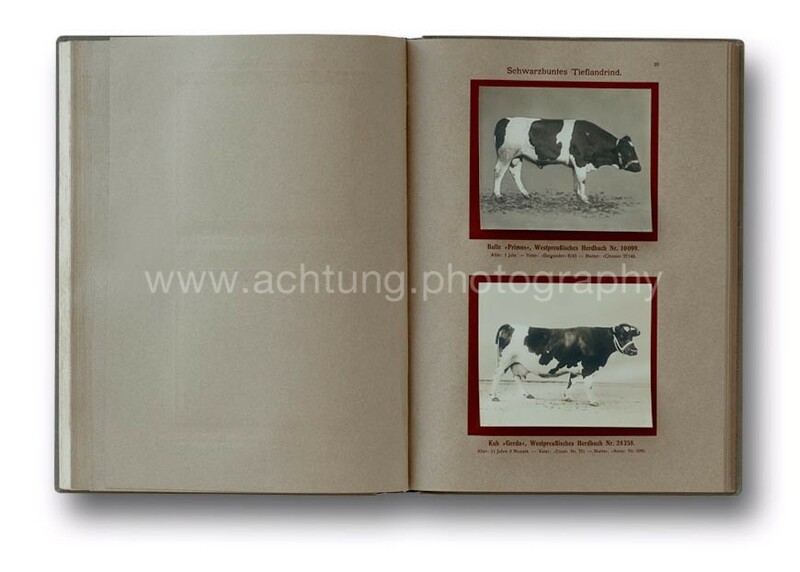 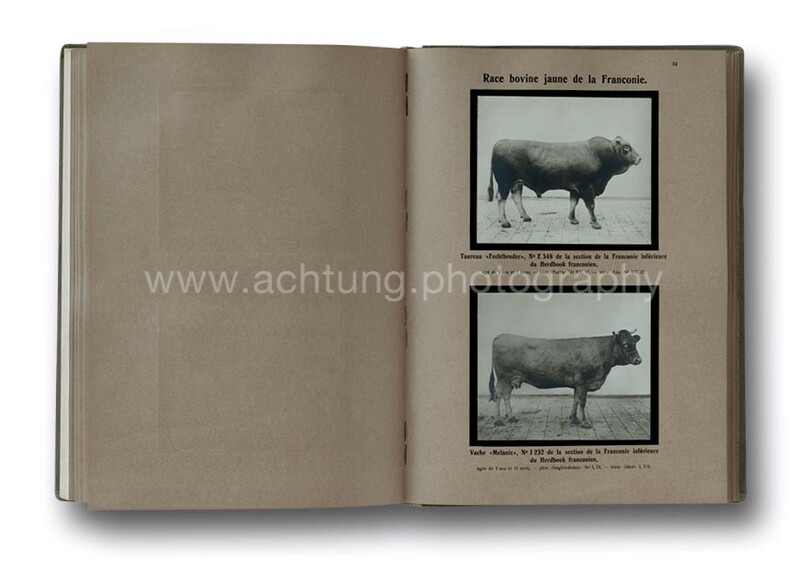 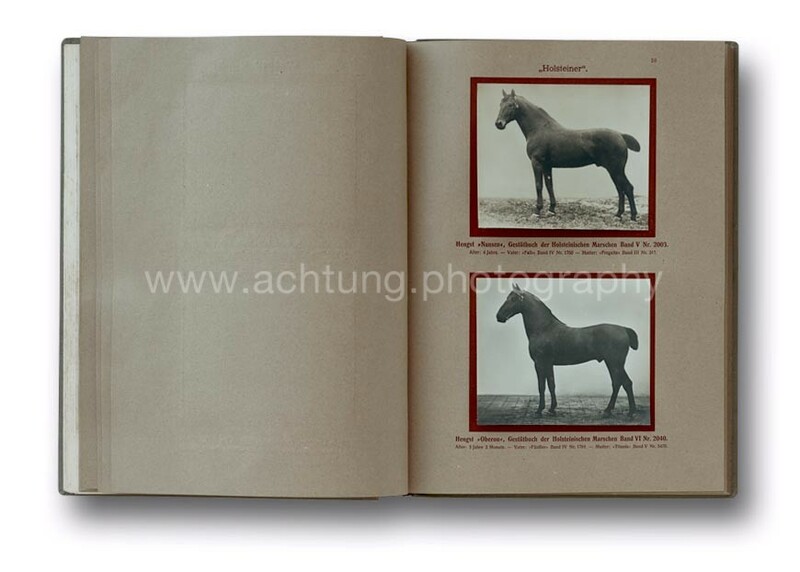 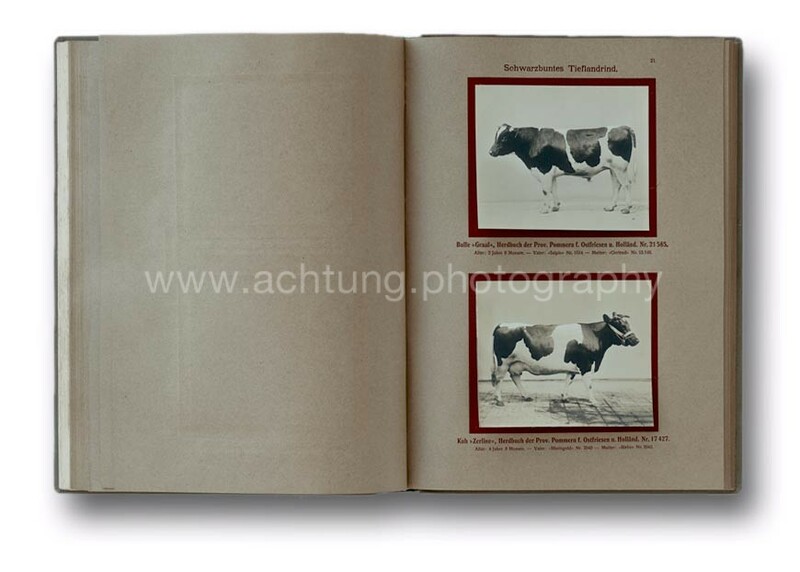 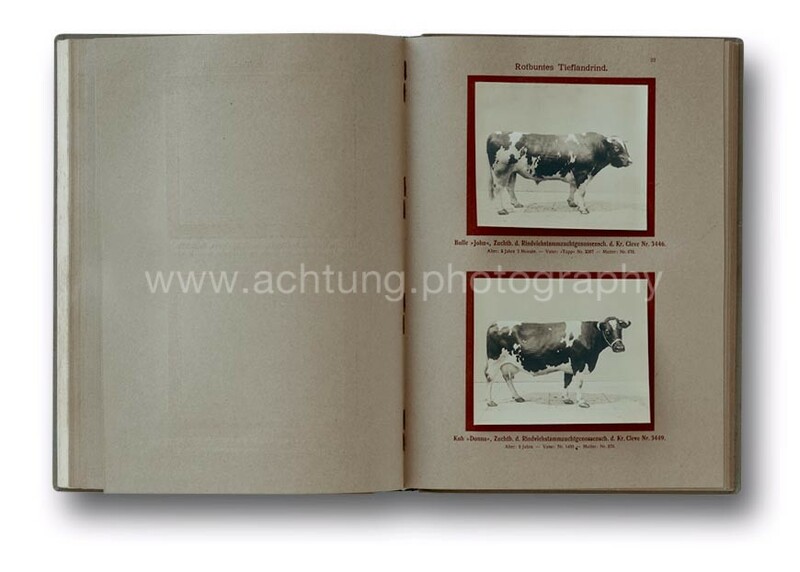 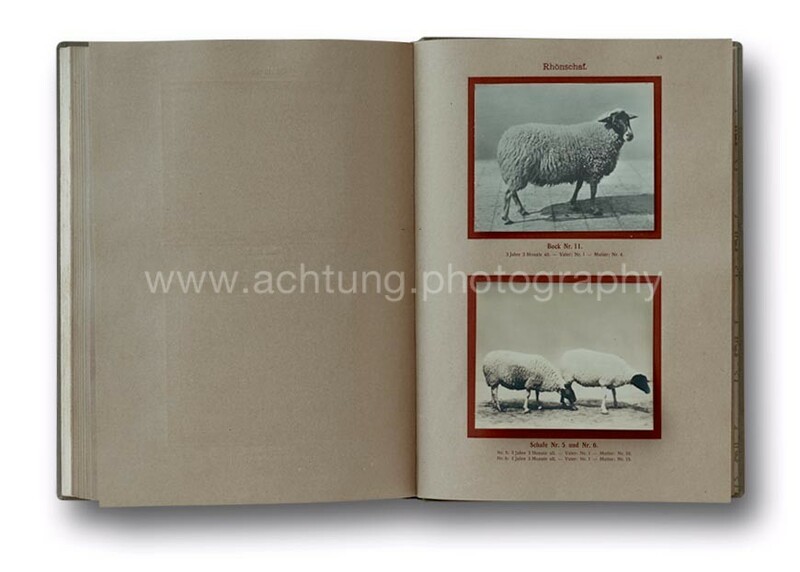 What makes this book so special (for anyone who isn’t a specialist of German agricultural history) is the inclusion of 106 real photographic prints. 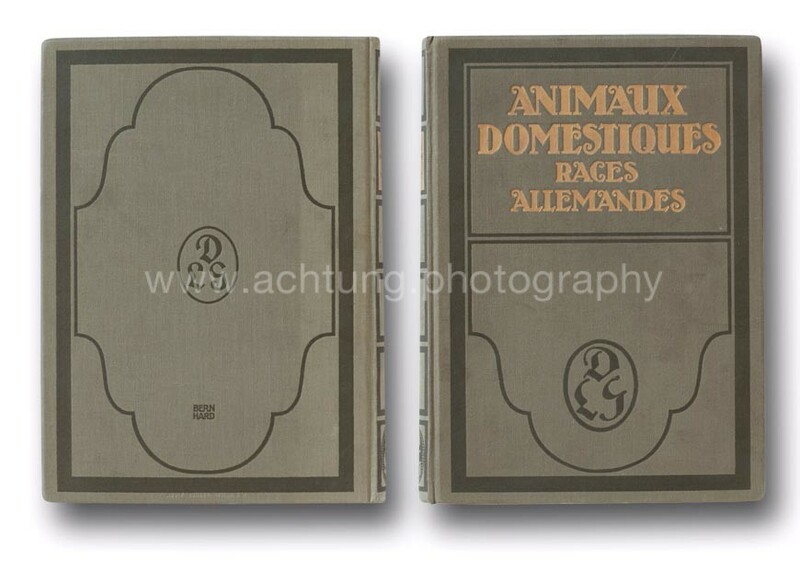 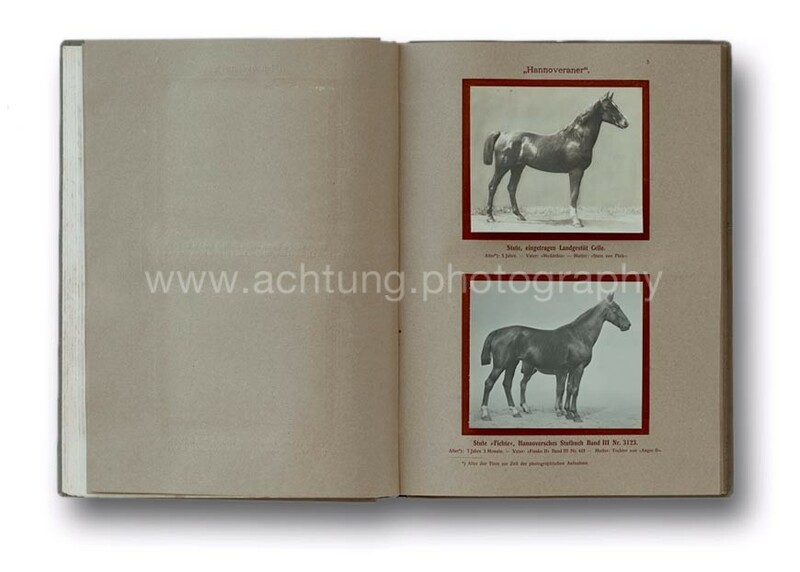 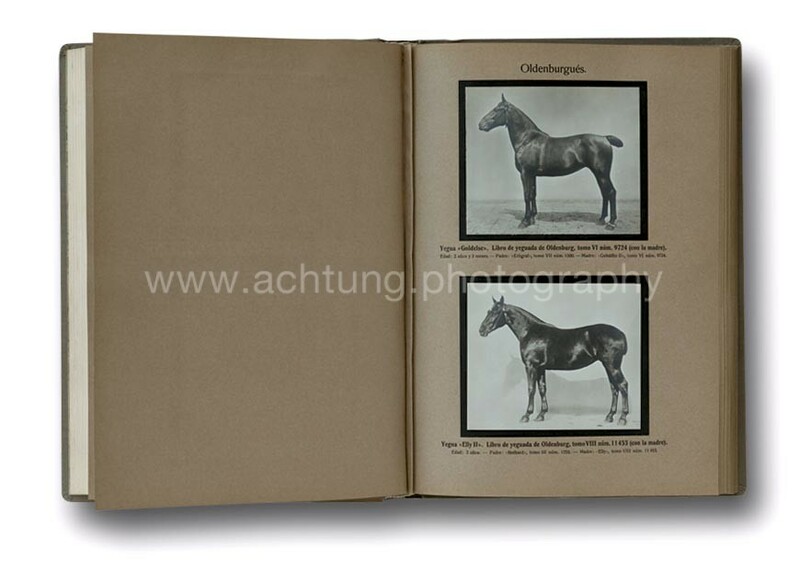 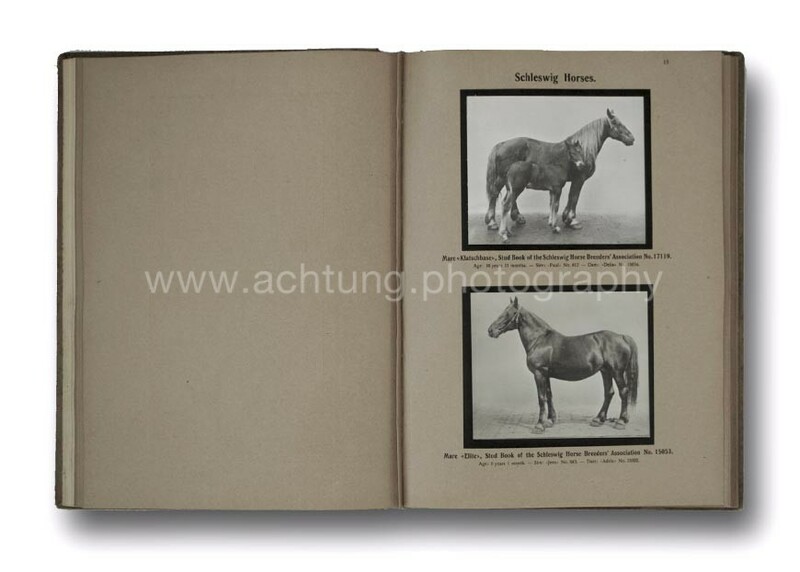 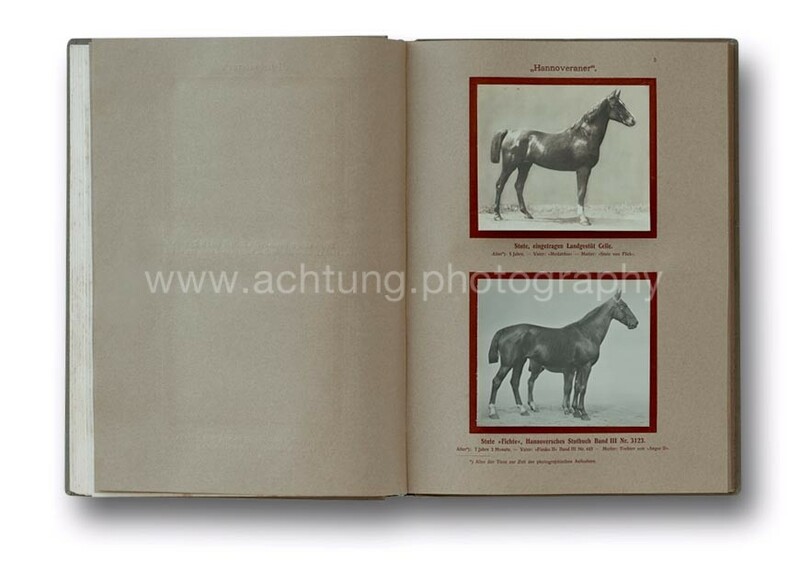 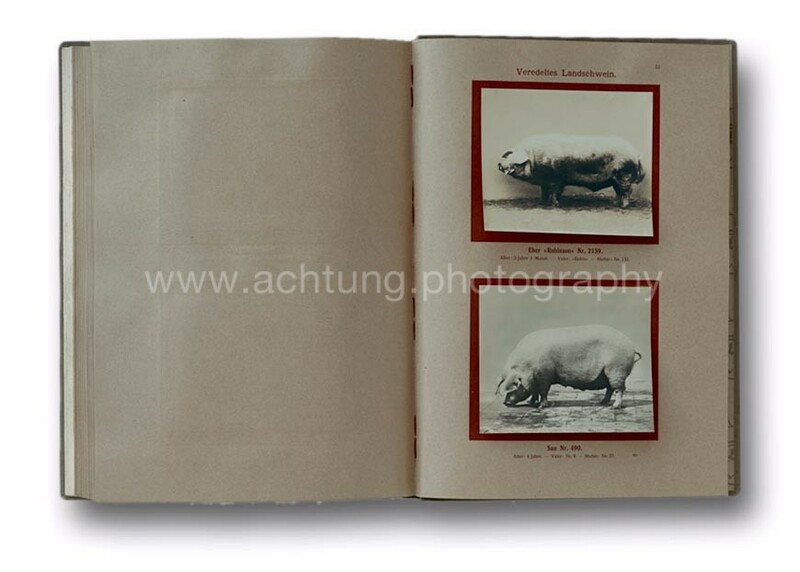 The second half (the ‘illustrated supplement’) of this thick, gold-lettered, and cloth-bound volume is packed with original silver gelatin photographs, two to a page, with a description of the featured animal. 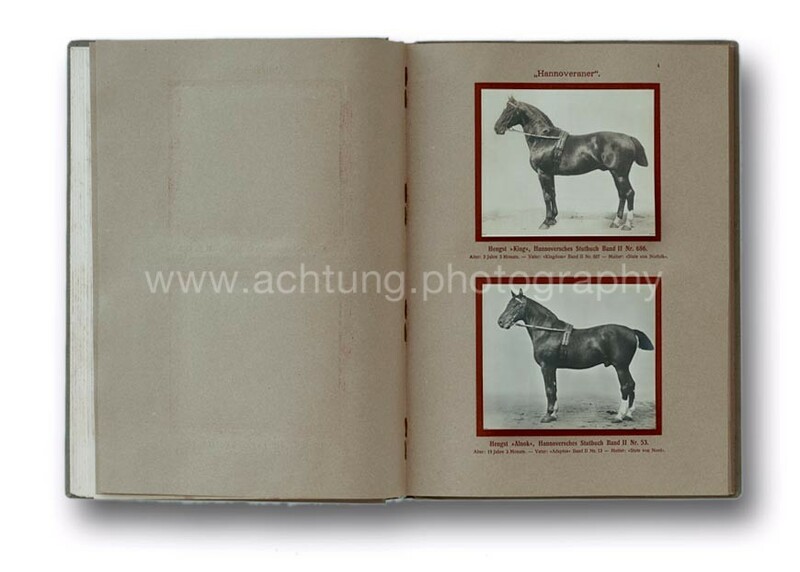 The photographs are obviously from various sources, locations, sessions and/or photographers. 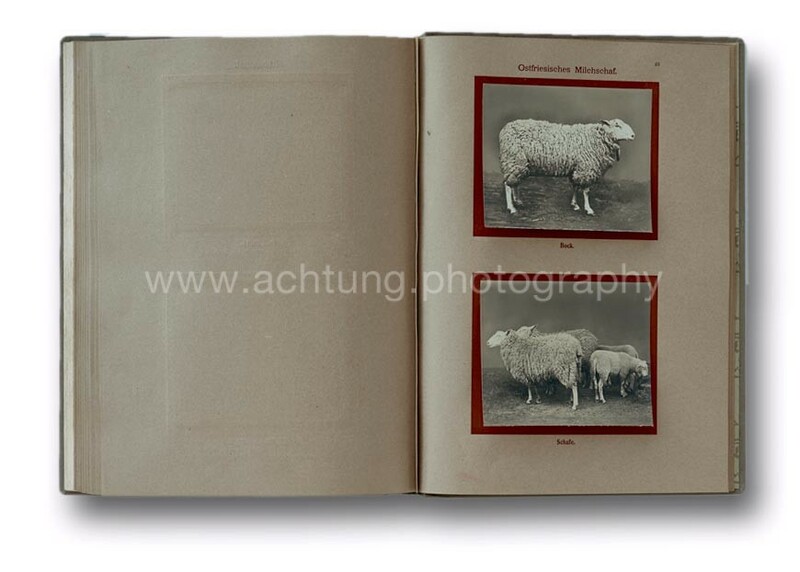 Each animal is photographed in profile, often in front of a white wall. 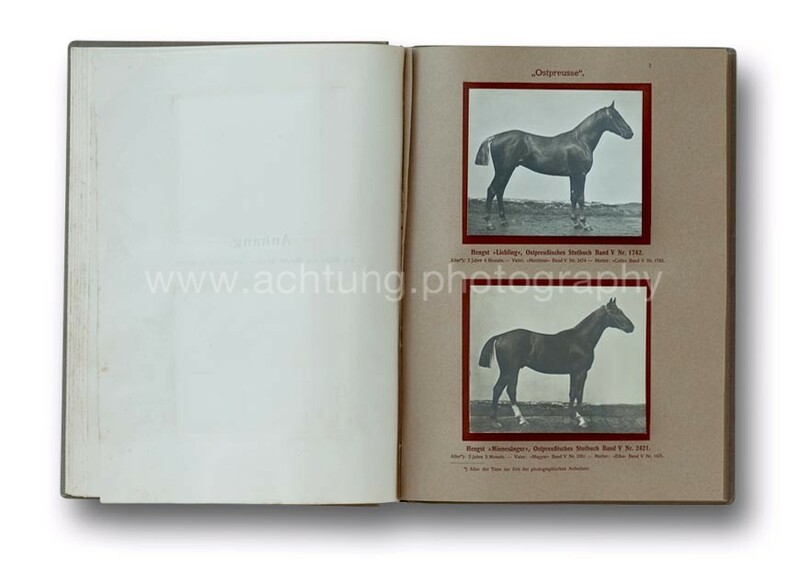 If photographed in some other setting, the background has usually been retouched away in order to keep a visual uniformity. 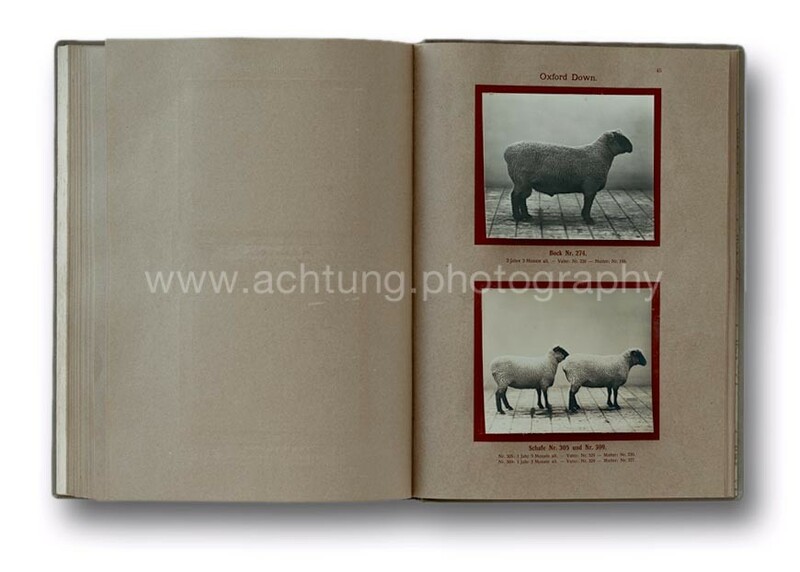 This gives the book a kind of conceptional feel. Informative, functional, illustrative and visually located somewhere between the animal locomotion photography of Eadweard Muybridge and the later, more technically perfect reportage work of Bernd and Hilla Becher. 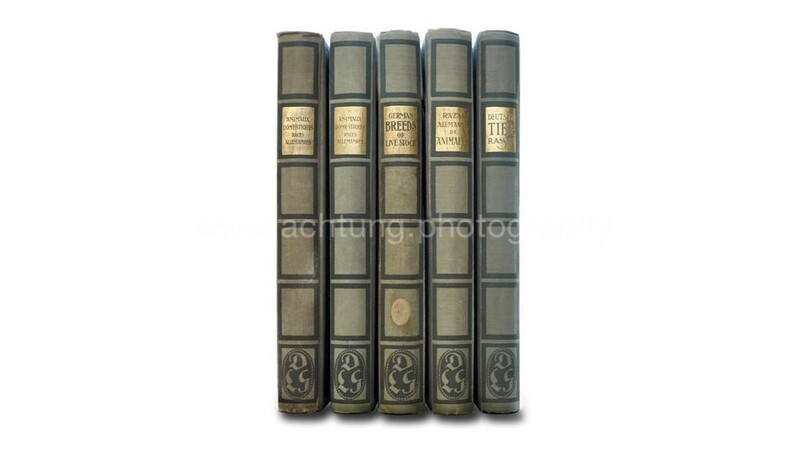 So far I have discovered four language editions: German, English, French and Spanish. 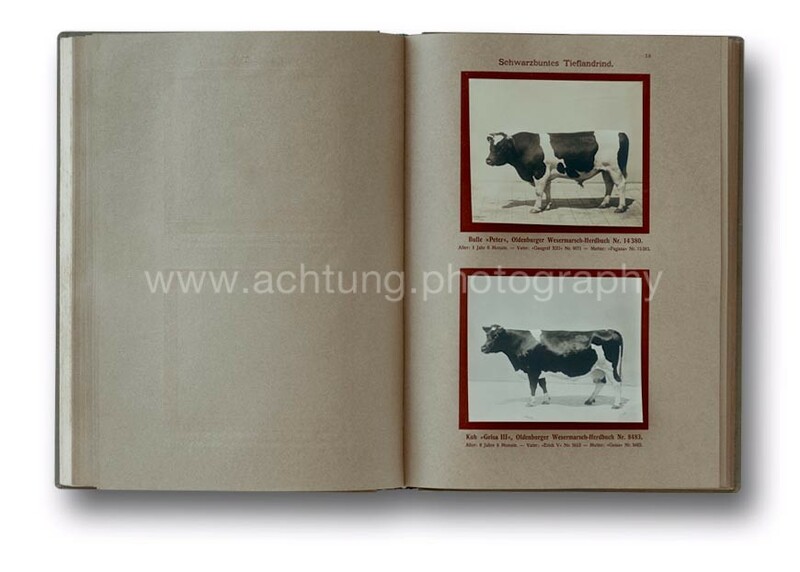 Each edition varies slightly in the graphic design, especially noticeable around the photographs. 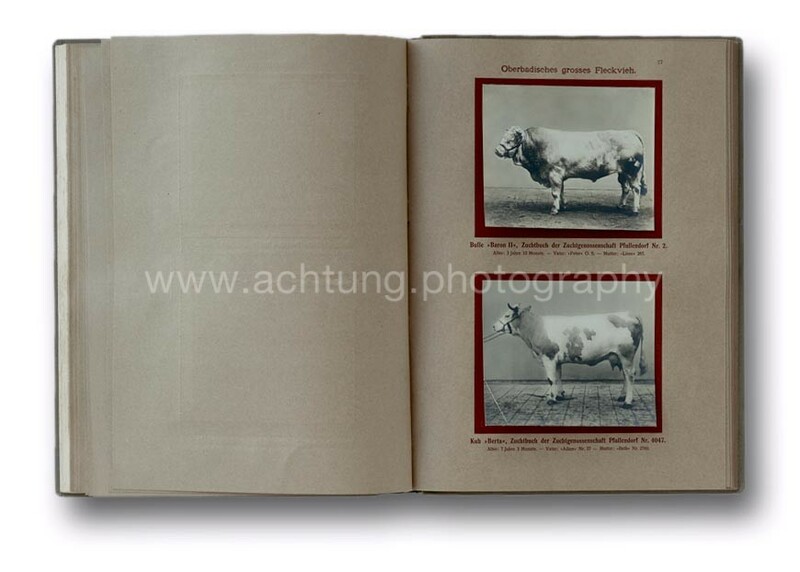 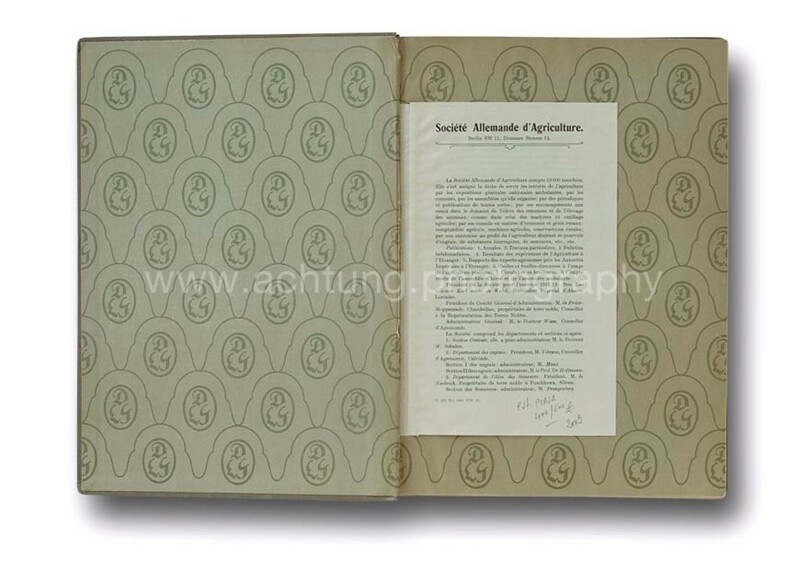 The logo of the German Agricultural Society is used as an ornament on the front and end papers. 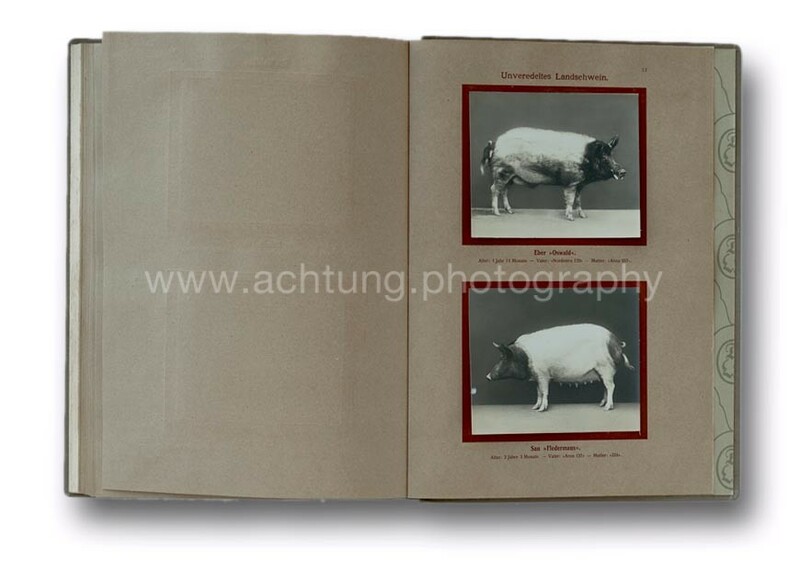 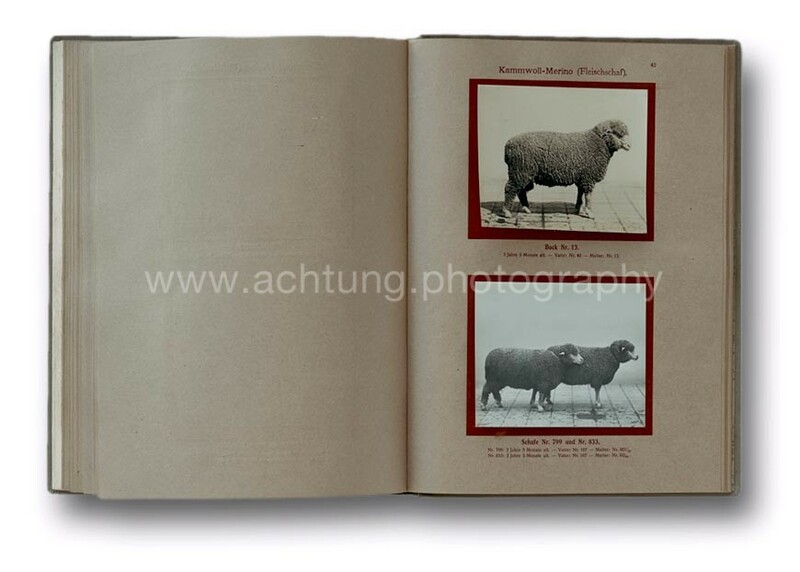 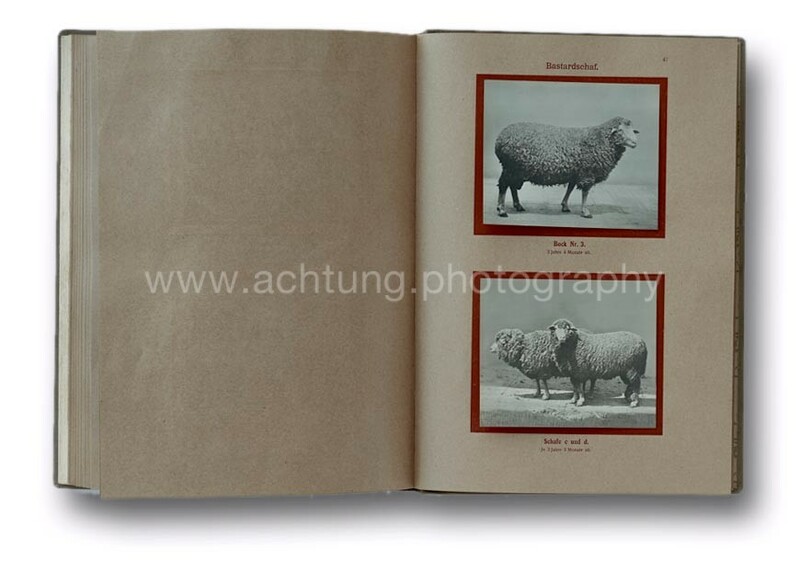 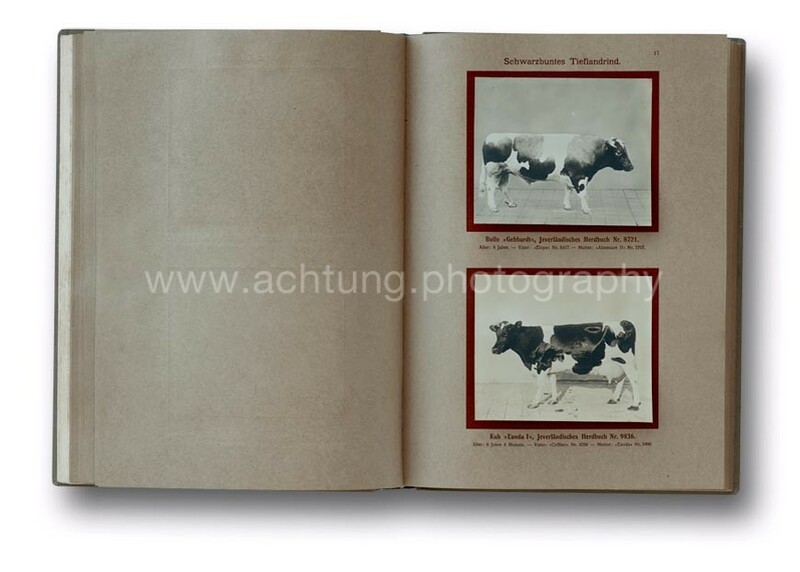 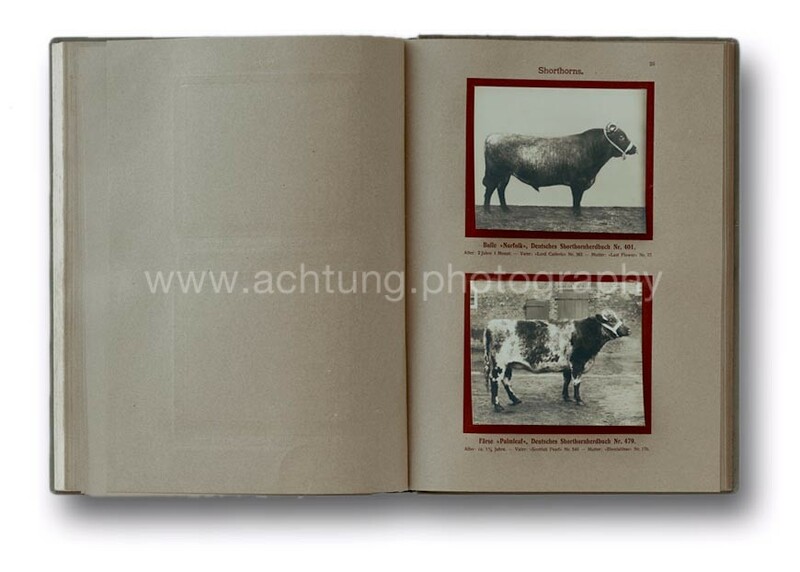 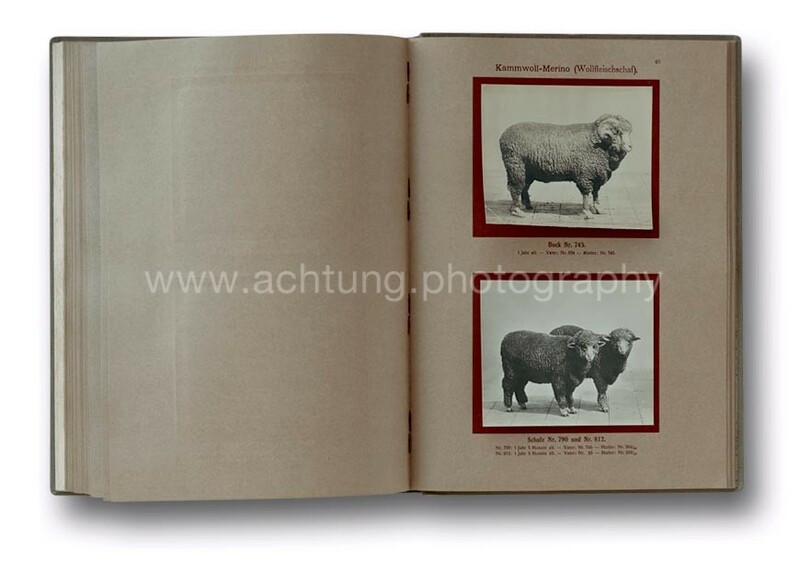 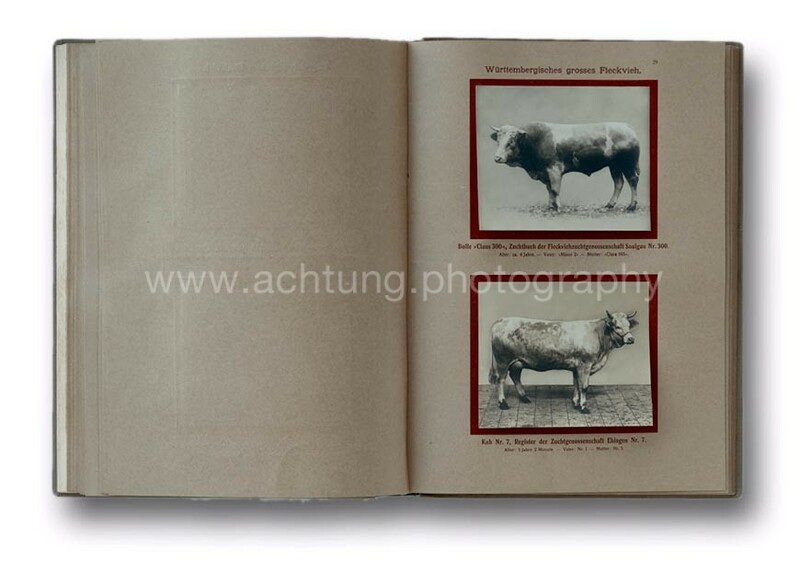 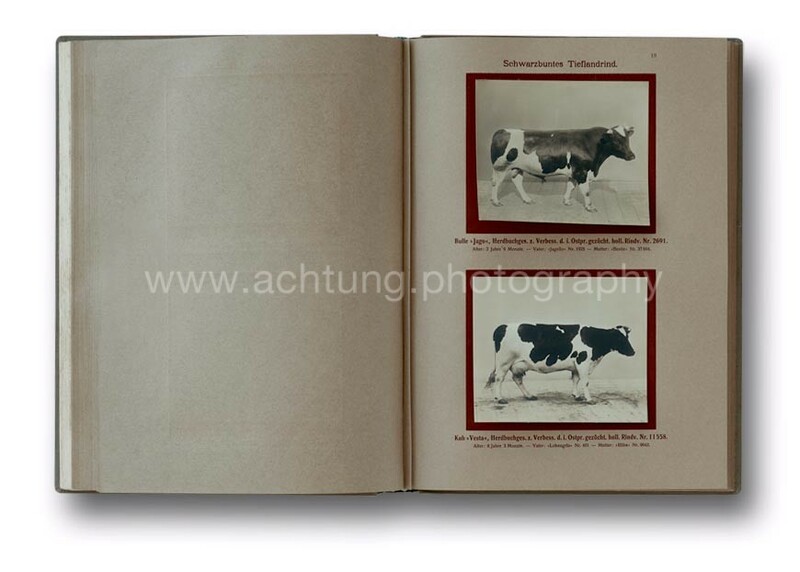 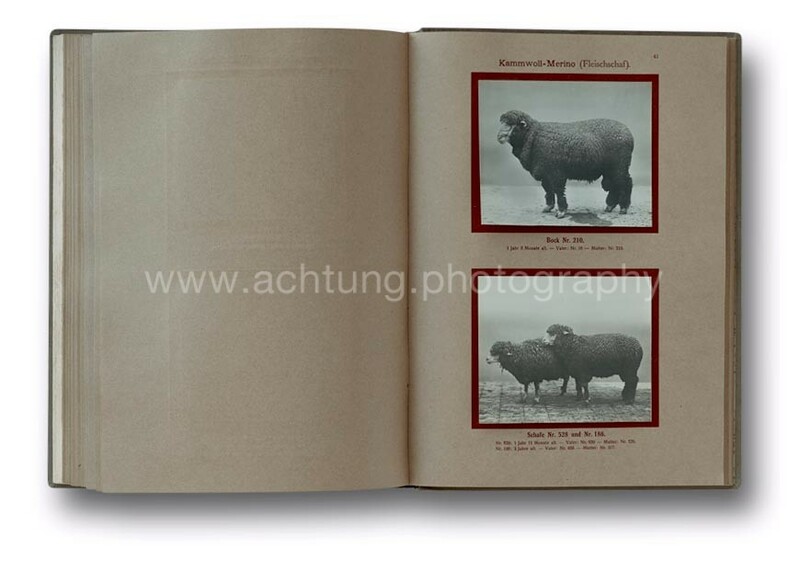 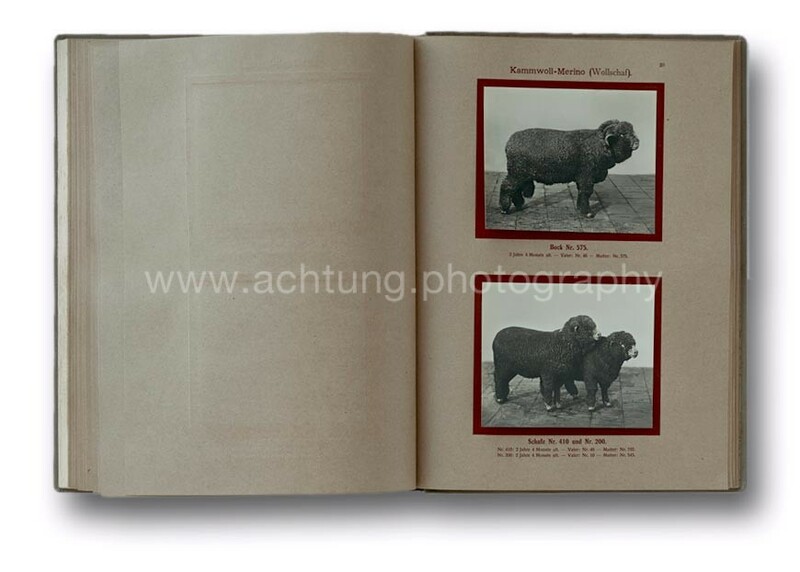 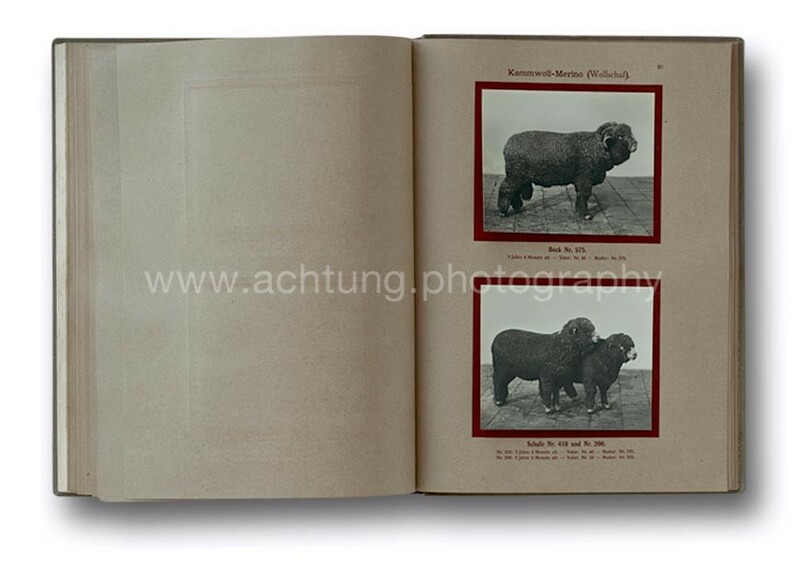 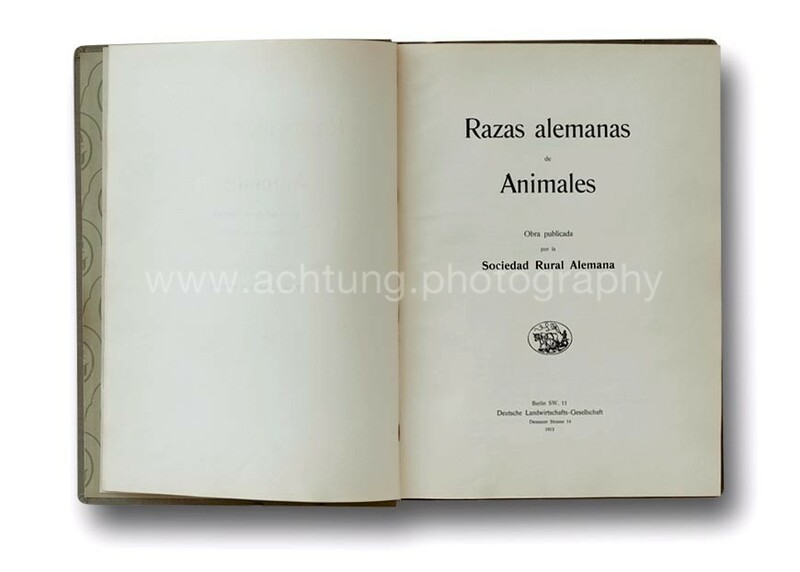 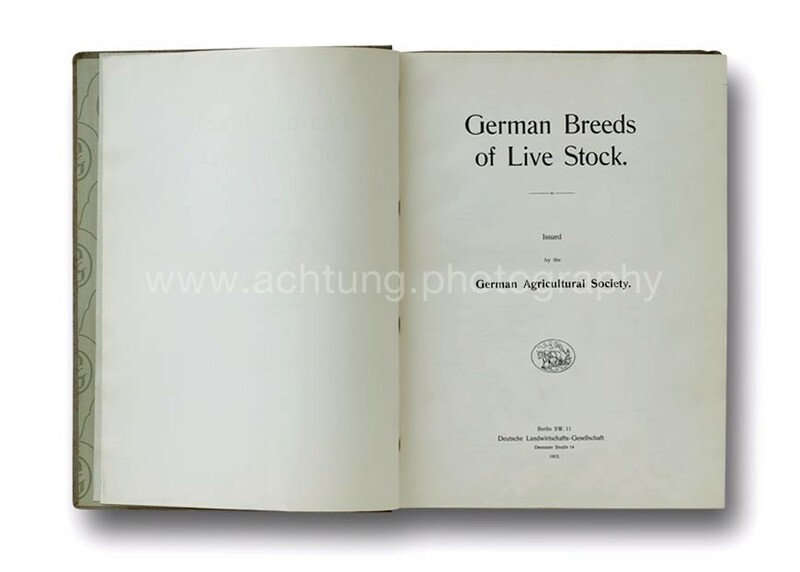 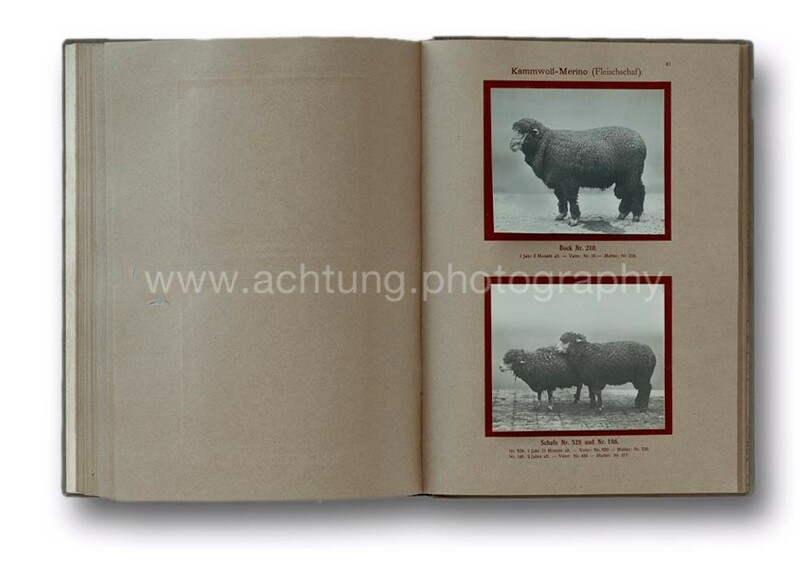 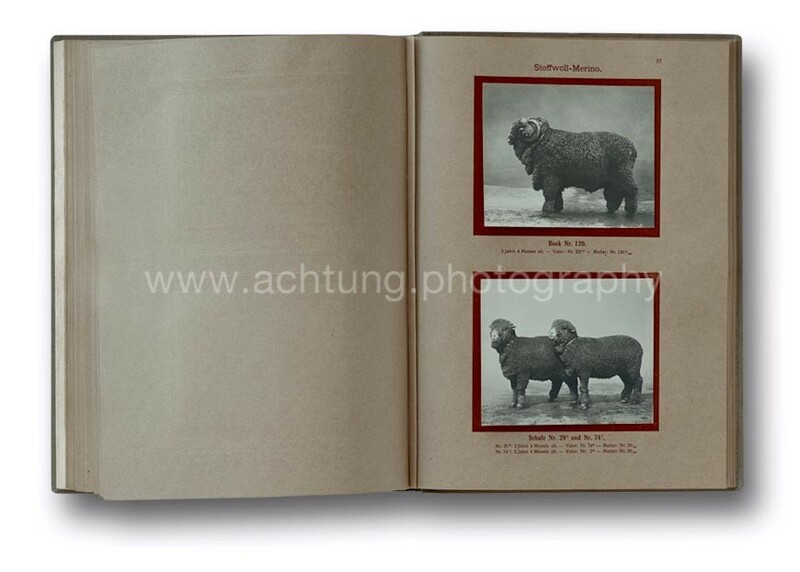 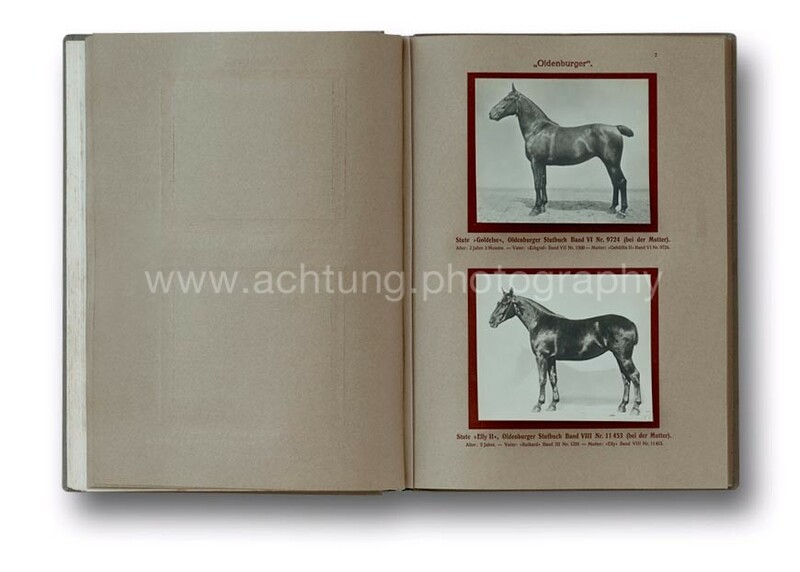 Presented by H. Hauptner Berlin N. W.
German Breeds of Live Stock issued by the German Agricultural Society. 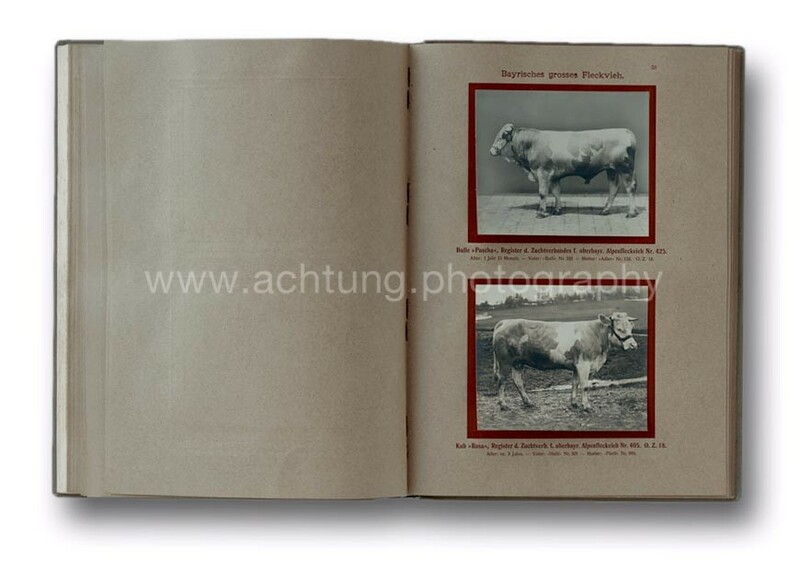 A four-page informational leaflet about the Deutsche Landwirtschafts-Gesellschaft (German Agricultural Society) is glued in at the front. 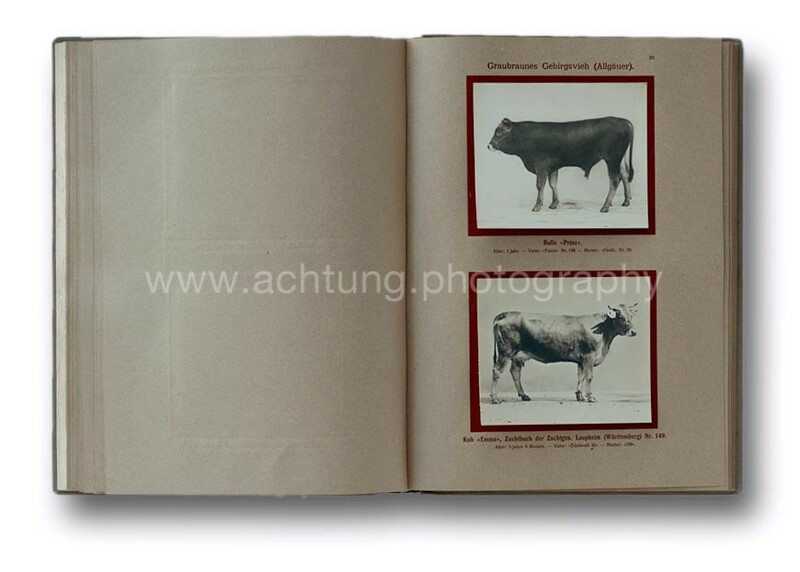 A red paper slip informs that the Deutsche Landwirtschaft Gesellschaft is pleased to give the current price information, but notes that prices may increase according to demand, especially concerning cows. 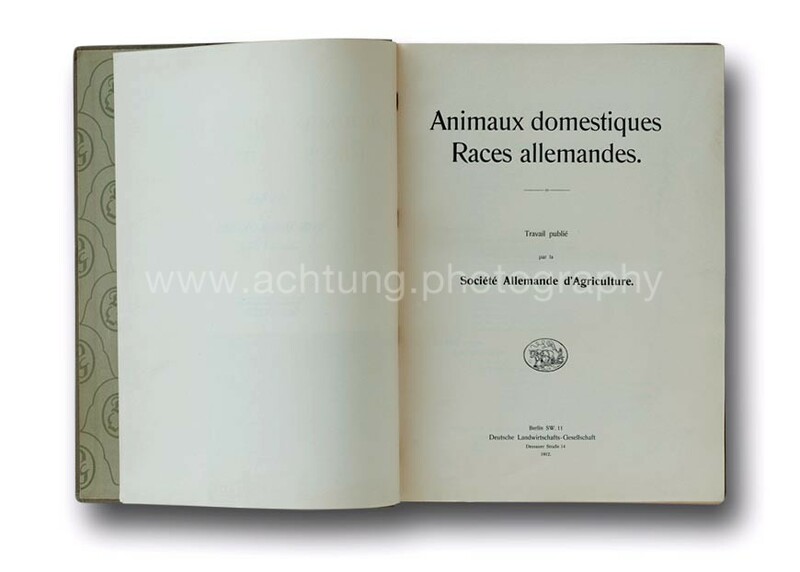 This is a French language edition for the Romanian market. 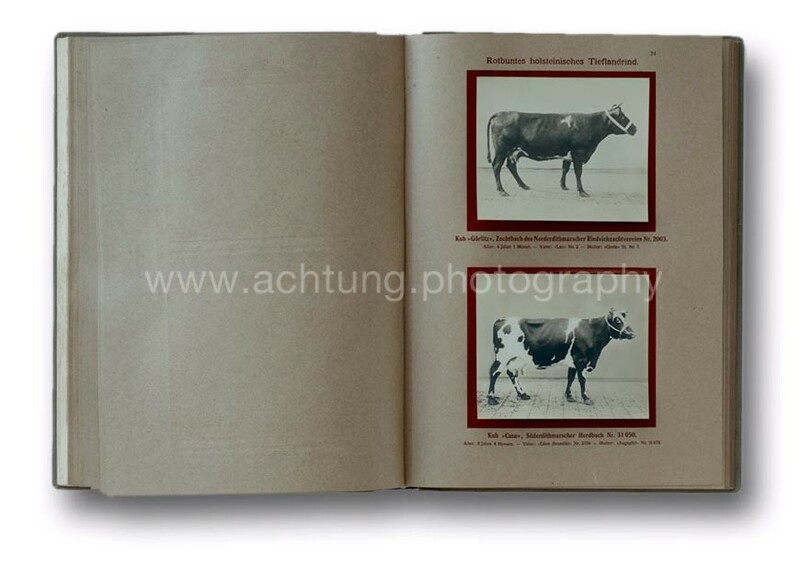 H. HAUPTNER BERLIN N. W.